This tutorial explains the basics of the Excel number format and provides the detailed guidance to create custom formatting. You will learn how to show the required number of decimal places, change alignment or font color, display a currency symbol, round numbers by thousands, show leading zeros, and much more. Microsoft Excel has a lot of built-in formats for number, currency, percentage, accounting, dates and times. But there are situations when you need something very specific. If none of the inbuilt Excel formats meets your needs, you can create your own number format. Number formatting in Excel is a very powerful tool, and once you learn how to use it property, your options are almost unlimited. The aim of this tutorial is to explain the most essential aspects of Excel number format and set you on the right track to mastering custom number formatting. 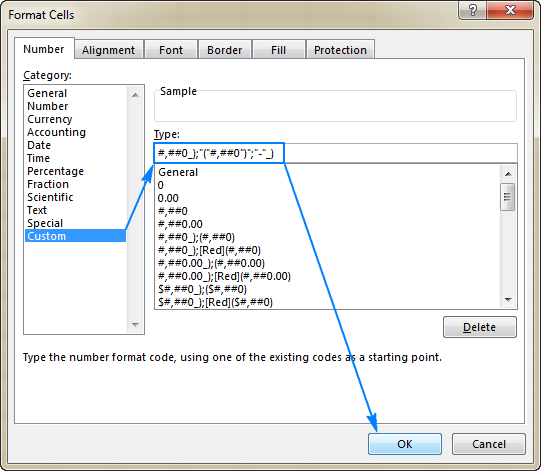 Select a cell for which you want to create custom formatting, and press Ctrl+1 to open the Format Cells dialog. Type the format code in the Type box. Click OK to save the newly created format. Tip. Instead of creating a custom number format from scratch, you choose a built-in Excel format close to your desired result, and customize it. To be able to create a custom format in Excel, it is important that you understand how Microsoft Excel sees the number format. Format for positive numbers (display 2 decimal places and a thousands separator). Format for negative numbers (the same as for positive numbers, but enclosed in parenthesis). Format for zeros (display dashes instead of zeros). Format for text values (display text in magenta font color). A custom Excel number format changes only the visual representation, i.e. how a value is displayed in a cell. The underlying value stored in a cell is not changed. When you are customizing a built-in Excel format, a copy of that format is created. The original number format cannot be changed or deleted. Excel custom number format does not have to include all four sections. If a custom format contains just 1 section, that format will be applied to all number types - positive, negative and zeros. If a custom number format includes 2 sections, the first section is used for positive numbers and zeros, and the second section - for negative numbers. A custom format is applied to text values only if it contains all four sections. To apply the default Excel number format for any of the middle sections, type General instead of the corresponding format code. Note. The General format included in the 2nd section of the format code does not display the minus sign, therefore we include it in the format code. To hide a certain value type(s), skip the corresponding code section, and only type the ending semicolon. For example, to hide zeros and negative values, use the following format code: General; ; ; General. As the result, zeros and negative value will appear only in the formula bar, but will not be visible in cells. To delete a custom number format, open the Format Cells dialog, select Custom in the Category list, find the format you want to delete in the Type list, and click the Delete button. For starters, let's learn 4 basic placeholders that you can use in your custom Excel format. 0 Digit placeholder that displays insignificant zeros. #.00 - always displays 2 decimal places. If you type 5.5 in a cell, it will display as 5.50. # Digit placeholder that represents optional digits and does not display extra zeros. That is, if a number doesn't need a certain digit, it won't be displayed. #.## - displays up to 2 decimal places. If you type 5.5 in a cell, it will display as 5.5. If you type 5.555, it will display as 5.56.
? Digit placeholder that leaves a space for insignificant zeros on either side of the decimal point but doesn't display them. It is often used to align numbers in a column by decimal point. #.??? - displays a maximum of 3 decimal places and aligns numbers in a column by decimal point. @ Text placeholder 0.00; -0.00; 0; [Red]@ - applies the red font color for text values. If a number entered in a cell has more digits to the right of the decimal point than there are placeholders in the format, the number is "rounded" to as many decimal places as there are placeholders. For example, if you type 2.25 in a cell with #.# format, the number will display as 2.3. All digits to the left of the decimal point are displayed regardless of the number of placeholders. For example, if you type 202.25 in a cell with #.# format, the number will display as 202.3. Below you will find a few more examples that will hopefully shed more light on number formatting in Excel. Theoretically, there are an infinite number of Excel custom number formats that you can make using a predefined set of formatting codes listed in the table below. And the following tips explain the most common and useful implementations of these format codes. 0 Digit placeholder that displays insignificant zeros.
? Digit placeholder that leaves a space for insignificant zeros but doesn't display them. , (comma) Thousands separator. A comma that follows a digit placeholder scales the number by a thousand. \ Displays the character that follows it.
" " Display any text enclosed in double quotes. % Multiplies the numbers entered in a cell by 100 and displays the percentage sign. / Represents decimal numbers as fractions. _ (underscore) Skips the width of the next character. It's commonly used in combination with parentheses to add left and right indents, _( and _) respectively. * (asterisk) Repeats the character that follows it until the width of the cell is filled. It's often used in combination with the space character to change alignment. 0 or # - display the nearest integer with no decimal places. 0.0 or #.0 - display 1 decimal place. 0.00 or #.00 - display 2 decimal places, etc. The difference between 0 and # in the integer part of the format code is as follows. If the format code has only pound signs (#) to the left of the decimal point, numbers less than 1 begin with a decimal point. For example, if you type 0.25 in a cell with #.00 format, the number will display as .25. If you use 0.00 format, the number will display as 0.25. #,### - display a thousands separator and no decimal places. #,##0.00 - display a thousands separator and 2 decimal places. Round numbers by thousand, million, etc. As demonstrated in the previous tip, Microsoft Excel separates thousands by commas if a comma is enclosed by any digit placeholders - pound sign (#), question mark (?) or zero (0). If no digit placeholder follows a comma, it scales the number by thousand, two consecutive commas scale the number by million, and so on. To add a single character, precede that character with a backslash (\). To add a text string, enclose it in double quotation marks (" "). Tip. To make the number format better readable, include a space between a comma and backward slash. Tip. To include a space between a number and text, type a space character after the opening or before the closing quote depending on whether the text precedes or follows the number, like in "Increase ". You can also create a custom Excel format that combines some specific text and the text typed in a cell. To do this, enter the additional text enclosed in double quotes in the 4th section of the format code before or after the text placeholder (@), or both. To create a custom number format with the dollar sign ($), simply type it in the format code where appropriate. For example, the format $#.00 will display 5 as $5.00. Use the numeric keypad to type the ANSI code for the currency symbol you want to display. If you try entering numbers 005 or 00025 in a cell with the default General format, you would notice that Microsoft Excel removes leading zeros because the number 005 is same as 5. But sometimes, we do want 005, not 5! The simplest solution is to apply the Text format to such cells. Alternatively, you can type an apostrophe (') in front of the numbers. Either way, Excel will understand that you want any cell value to be treated as a text string. As the result, when you type 005, all leading zeros will be preserved, and the number will show up as 005. If you want all numbers in a column to contain a certain number of digits, with leading zeros if needed, then create a custom format that includes only zeros. Tip. If you are entering phone numbers, zip codes, or social security numbers that contain leading zeros, the easiest way is to apply one of the predefined Special formats. Or, you can create the desired custom number format. For example, to properly display international seven-digit postal codes, use this format: 0000000. For social security numbers with leading zeros, apply this format: 000-00-0000. To display a number as a percentage of 100, include the percent sign (%) in your number format. For example, to display percentages as integers, use this format: #%. As the result, the number 0.25 entered in a cell will appear as 25%. Fractions are special in terms that the same number can be displayed in a variety of ways. For example, 1.25 can be shown as 1 ¼ or 5/5. Exactly which way Excel displays the fraction is determined by the format codes that you use. # #/# - displays a fraction remainder with up to 1 digit. # ##/## - displays a fraction remainder with up to 2 digits. # ###/### - displays a fraction remainder with up to 3 digits. ###/### - displays an improper fraction (a fraction whose numerator is larger than or equal to the denominator) with up to 3 digits. Tip. To enter a fraction in a cell formatted as General, preface the fraction with a zero and a space. For instance, to enter 4/8 in a cell, you type 0 4/8. If you type 4/8, Excel will assume you are entering a date, and change the cell format accordingly. 00E+00 - displays 1,500,500 as 1.50E+06. Most of the format codes we've discussed so far contained just 1 section, meaning that the custom format is applied to all number types - positive, negative and zeros. To make a custom format for negative numbers, you'd need to include at least 2 code sections: the first will be used for positive numbers and zeros, and the second - for negative numbers. The built-in Excel Accounting format shows zeros as dashes. This can also be done in your custom Excel number format. As you remember, the zero layout is determined by the 3rd section of the format code. So, to force zeros to appear as dashes, type "-" in that section. For example: 0.00;(0.00);"-"
The above format code instructs Excel to display 2 decimal places for positive and negative numbers, enclose negative numbers in parenthesis, and turn zeros into dashes. If you don't want any special formatting for positive and negative numbers, type General in the 1st and 2nd sections: General; -General; "-"
If you don't want the cell contents to ride up right against the cell border, you can indent information within a cell. To add an indent, use the underscore (_) to create a space equal to the width of the character that follows it. Most often, the right indent is included in a positive number format, so that Excel leaves space for the parenthesis enclosing negative numbers. Changing the font color for a certain value type is one of the simplest things you can do with a custom number format in Excel, which supports 8 main colors. To specify the color, just type one of the following color names in an appropriate section of your number format code. Note. The color code must be the first item in the section. To repeat a specific character in your custom Excel format so that it fills the column width, type an asterisk (*) before the character. This formatting technique is commonly used to change cell alignment as demonstrated in the next formatting tip. A usual way to change alignment in Excel is using the Alignment tab on the ribbon. However, you can "hardcode" cell alignment in a custom number format if needed. For example, to align numbers left in a cell, type an asterisk and a space after the number code, for example: "#,###* " (double quotes are used only to show that an asterisk is followed by a space, you don't need them in a real format code). 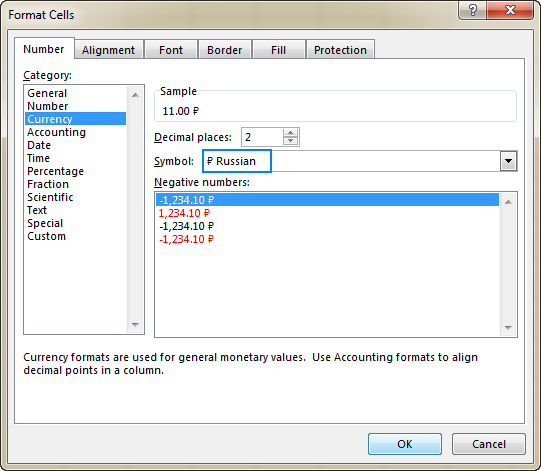 The asterisk that follows the currency sign tells Excel to repeat the subsequent space character until the width of a cell is filled. This is why the Accounting number format aligns the currency symbol to the left, number to the right, and adds as many spaces as necessary in between. To have your custom Excel format applied only if a number meets a certain condition, type the condition consisting of a comparison operator and a value, and enclose it in square brackets . If a cell value is equal to 1, it will display as "1 mile". If a cell value is greater than 1, the plural form "miles" will show up. Say, the number 3.5 will display as "3.5 miles". In this case, the value 3.5 will appear as "3 1/2 miles". Tip. To apply more sophisticated conditions, use Excel's Conditional Formatting feature, which is specially designed to handle the task. A custom Excel format is stored in the workbook in which it is created and is not available in any other workbook. To use a custom format in a new workbook, you can save the current file as a template, and then use it as the basis for a new workbook. To apply a custom format to other cells in a click, save it as an Excel style - just select any cell with the required format, go to the Home tab > Styles group, and click New Cell Style…. To explore the formatting tips further, you can download a copy of the Excel Custom Number Format workbook we used in this tutorial. I thank you for reading and hope to see you again next week! 194 Responses to "Custom Excel number format"
Sorry, it's difficult to say anything without seeing your worksheets. There can be a number of reasons that cannot be detected remotely, e.g. numbers formatted as text. Usually, we publish a sample workbook containing all of the formulas discussed in a post. Have you downloaded that workbook? Do those formulas work on your side? 4. Click enter and voila! If you want to add the variable data elsewhere in the text string just alter the "constants" in the formatting and enter your zeros or place holders where you want your variable data to be entered. Just make sure that when you format the cell for numbers (using 0s) don't enter alphabetical data. And vice versa for text formatting (using @). If your cell is looking for letters and gets numbers or the other way around, the formatting won't work. you'll just see the numbers or letters you input into the cell. Is there a way to get Custom Formatting to be ALL CAPS for datetimes? I can't apply the UPPER function which applies to text because Excel stores the date as a datetime code which is a pure number. How can I trim only the decimal part from my figure. Please give me a solution, Thanks in advance. These options would only treat up to two digits behind the decimal point and would trim any additional digits. =MOD(1435.50,1) will give you the "remainder" of the number as divided by 1 (the argument in the MOD), so you will have .50. If you need it to be 50, then it's =MOD(1435.50,1)*100. I work for an engineering company and the engineers requests can be quit specific. I have searched and searched to find the code to make diagonal stacked fractions that show the numerator as superscript and the denominator as subscript. Can you help with this. This has been helpful but hasn't quite hit the nail on the head for me. I have a cell that is displaying numbers through vlookup, some of the numbers are whole numbers and others have a decimal place. I would like the whole numbers to show as whole numbers without a decimal point. I also would like to show a unit with it. It seems I can do either one or the other but haven't figured out how to get both into one format. Is it possible to do that? Immediately figured it out, just had to have General "unit" after the semicolon. How do I put commas in the numerator and/or denominator of fractions? For example, 23 3,289/4,536. I tried various combinations of #, 0, and ? but to no avail. I am also seeking a solution for leading zeros with a mix of digits and numbers so I can sort by number, rather than having all text-only entries at the end. For example, I want the following data: 001, 001A, 001R, 002, 002R to sort in that order. If I format as text, my leading zeros disappear and if I format as a number using 000 as a custom format to maintain the leading zeros, the data sorts as follows: 001, 002, 001A, 001R, 002R. Any suggestions would be greatly appreciated! plz guide me on the above. i use the custom formula is #° 00' 00.00 for 22° 05' 17.10.
some times when I writ number in a cell, the number automatically changes to date. how can I solve this problem.please help me. I have a column of about 2000 numbers. How do I change the number format from, say, 11709 to 1170/900? All of my excel spreadsheets seem to be corrupted. When I go to the format cell, the only option given me is negative numbers in Numbers and Currency. What happened and how do I get back to the default Format? How to write in excel cell like password in any website login. Reply if any formatting available for it or any function. Reconsider storing usernames and passwords in Excel. I want to create an Excel sheet with user names and Passwords which can be opened by multiple users. However, I do not want them to see the passwords entered there. Instead of seeing AB12 in the cell, I would like to see XXXXXX or ****. Great job making these instructions! I easily found what I needed for a change! Kudos. hi, i want to change the thousand separator for Style 1,234,633.53. when I have tried as per the suggestions above..I can only change as 12,34,633.53. How do I get the result of a formula to display as currency? I have already formatted the cells as currency, they are all the same. This is my formula. I am starting with a base number, not in a cell. The number in cell H19 is a currency amount, and formatted as such. my result is 240, but it will not show up with the '$' no matter what I try. I have a number 1.026596 but I'm wanting to format it to read 1026.596 so what Custom format would I use??? Thanks! I am unable to find any format to change decimal place however you can use below formula. so paste this formula in A2 Cell. * What happens if the length of the whole number portion is longer? This formula depends upon the decimal being the second character. * This formula also converts the value to text. If you want to use the value elsewhere, then you have to convert it back to a number. Just multiply the A1 value by 1000 and the decimal place will be moved. Thanks for the page.As you said,holding ALT key and pressing ANSI code, say 0176 for degree symbol returns a error sound.any other method for format numbers with special characters? i'm using office 2010 version. Make sure you are typing on the numpad. And make sure the numlock is on. How can I show the amount like following . in a single cell in excel ? Simply apply the Accounting format to the cell. How do I get it to work for the negative? This worked for me in Excel 2010. Are those the original numbers or what they are supposed to be? Explain what they should be. Hi I am able to hide the cell value with format cell >> Custom >> Type after adding three times semicolon but I want if any one take cursor on that cell then value should be visible. Please help. hi i need help please! I have string of text/numbers in the form "A123412123456" that I would like displayed as "A1234 12 123455" with the spacing as indicated. Can anyone help? I have an issue with Fraction in Microsoft Excel 2016 when I want to calculate fraction of, an example, 0 and 7. Excel calculate it as 0 but I want to calculate it as 0/7 so I don't need to write it manually. Give example of other things that work, your question doesn't make much sense alone. I have read several articles and I have not found how to apply a single format to accomplish the above. This is a great help, thank you very much. 15 is formatted as 15. Would you be able to help with that? I figured out how to change 131430026910035 into 13-143-0-0269-10-035 which is what I need for one spreadsheet. For another spreadsheet I need the same number but without the first 6 digits. 0269-10-035 Is there a way to do this? Hi! Is it possible to change the colour of one of the labels in X axe?? They are formated as text and I need so mark one of them (as it's a special case). Is there a way to use value of a cell in custom formatting. 1. Cell A1 value = "A"
2. The formatted cell has 3.01 value. 3. I would like the number to be formatted as : "A3.01"
4. If the value of A1 changes to "B", the formatted cell should display "B3.01"
I'm afraid that it's impossible to use any formulas in custom formatting. However, as a workaround I can advise you to try and use conditional formatting instead. You'll be able to set the rules that will change the value in one cell depending on the other one. I have huge data in one column in excel in custom format (like 40000.00Cr or 5000.00DR) I want to convert the Cr amounts into negative. Please suggest which formula is required for customer formatting in excel. I want custom formatting in text & number with general. "0 - "#0" KM";"0 - "General;@" KM" this formula is correct or not please suggest. Hi. I want to display a number, say, 20 in format "at 20°C". I make Custom Formatting as "at "#"°C", and it shows what I want if the temperature is positive. When it is negative I see "-at 20°C". Please help. How do I format a percentage to show the “0” in front of the decimal. Example when I type in .25% it shows up as 25.00% but when I type in 0.25% then it shows up as 0. How can i carry the formatting of a cell in a text box? For example, i formatted a cell with red font when negative value. The color doesn't carry over to the text box if i reference it to that cell. How can i carry over the formatting of a cell in a text box? For example, i formatted a cell with red font when it has a negative value. The color doesn't carry over to the text box if i reference it to that cell. It looks like you've got the Excel formatting down, but the web formatting isn't cooperating: the formatting involving ???.??? doesn't actually line things up in the "Display as" boxes, though in Excel it works perfectly as described. I noticed that excel 2016 (.xlsx) doesn't have the same complement of cell custom formats as Excel 2007 (.xls). I am using 'times' expressed in minutes, seconds & thousands of secs (i.e. mm:ss.00), Excel 2016 lets you choose (mm:ss.0). I need to save these values as a .csv file. I can modify them in the spreadsheet in the 'Type' line by adding an extra '0' digit to the format. Problem is, it's not permanent as the next time I open the .csv file in Excel, its back to the old 'mm:ss.0' format. Any way to make that permanent ? We have an article on our blog that describes how to use conditional formatting in Excel. Please have a look at it. It will always be an integer value between 0-3. I'm in too deep with formulas to change the actual cell value. Thank you! This is an excellent resource you've compiled. In other words, I don't want any extra 0's after the decimal point, and if there are no fractions, I don't want the decimal point at all. Thankyou sir, its very helpful for us.. Awesome tutorial. Makes for a great reference guide. Thank you! I'm trying to use text and currency in the same cell using distributed indent. with the currency on the right. how do i get the dollar sign to show up? These both work, but #2 is the more elegant solution. Huh? OK, so let's try splitting it up (note that this commenting system also deleted the ">" in the ">=". So maybe it doesn't like the ">" operator? The first part should read: "[=1000000]#,#.##,, \M_)"
If this doesn't work, I give up. "For example, 1.25 can be shown as 1 ¼ or 5/5." I am trying to use Custom format for a chart. If the data is a number that it is pulling from, then I want a number to be shown. If the data changes to a currency, I want the chart to automatically change to currency. Is there a way to do that? I would like to know if there is a way to add an inch (") after the values on my dimensions? 2.75x5x.25 is my dimension, and I need it to look like 2.75"x5"x.25" on Excel. Is there a way to do that? Any help would be greatly appreciated. The way to do this is to enter #?'' in the custom format list and then apply that formatting to the cell. Those are two single apostrophes after the question mark. The cell will display 2.75'', but you can use arithmetical operations on the entries. Wondering if it is possible to format a cell to automatically divide whatever # is entered into the cell by 3.28? Is there a custom format to always round up or down or does it have to be part of a formula? Sometimes when rounding up I want a result or copied value of 1.1 to show as 2. Other times when rounding down I want a result or copied value of 1.9 to show as 1. I'm trying to convert from 1000000 to 1 M in office 2016 and none of the methods above are working. anyone else know a solution? Enter this into the Format Cell window under the Number/Custom tab 0,,\M You'll still need to enter the number as 1000000 but it will be displayed as 1M and you can use it arithmetic operations as 1000000. Any way to get rid of the decimal for whole numbers when aligning decimals (for mixed fractional/whole numbers) with something like the 0.?? format? In other words is there a conditional for determining whole numbers? Wonderful. Great load of information. I would like to know if there is a method that when I type Up in my cell, it shows 1, and when I type Down in the cell, it shows 0.
how could i show the cell with the negative values with pharenthesis? How can I make a '0' on the left side of another digit visible in the cell? Ex. 03, 01, etc. Change the number format to custom to include the number of zeros and digits you need e.g., "0000". This will display 0123. In the Type field enter the total number of digits you want to display. For example, entering five zeros will allow the cells to display five digits including any leading zeros. Click OK and you're ready. Set the cell's format to Text, and then type 5-15. I think what you want to do is display the numbers with two decimal places. You do this by formatting the cells that contain the numbers. Start by selecting the cells that contain these numbers then right click, choose Format Cells, then click the Numbers tab and you will see a list of formatting options. You can test each format for your particular need. If I'm understanding your question, you want the Number format as its default display uses two decimal places. Awesome document: clear, to the point, and the instructions work! Glad I found this website. i have AMN and 0001 IN tow column in excel ,when CONCATENATE(A1,"-",B1) It shown AMN-1 ,and do not show 000. Is the "0001" in B1 formatted as text or a custom format "0000"? How is the cell that displays "AMN-1" formatted? It appears as if the formatting is different for the two cells. Excel won't display leading zeros as in "0001" unless the value is text or the cell has the Custom Format "0000". The General formatting will work for this, too. In your case I would assume that General formatting will work because there is the "AMN-" included with the "0001". Right click on the cell that holds the "0001" and choose Format Cells, then choose General from the list. Do the same for the cell that holds the concatenated result. Both cells should be formatted as General. Of course he did not care),The two cell formats are the same. when click on "0001" cell shown "1" I do not know what to do. Can i send you a file? I have a problem with Access. Can anyone help? What ever format I choose to change the code the excel returns back an error msgbox that ((not included,excel can't create...)). I don't think its a matter of formatting the cell. As best that I can tell you can achieve the end result like this. Because there is no pattern to the text other than the number of digits I used three different formulas. I use Excel 2016, so my concatenation function might be different than yours. I Have a Question About An Access File? How do I format a decimal number to the unit using the costume format. I don´t want it to roud the number. Where 3,84 is in cell M40 you want the function to return only the first digit. I have a dilemma that I can't resolve and can find no relevant examples. I have two tables with Class mnemonics listed in the format - 00:00.00.
some are formatted as custom but with different custom formats and some are as general. some show up as 00:00 while others might be 00:00:00. The last 2 digits may sometimes be intentionally blank which adds to the confusion. I need to get all these into a consistent format so I can do a VLOOKUP across the 2 tables and match data. Also, if I try formatting to test or number I get very strange results and sometimes the format wants to make it time (complete with am or pm) aaaggghhh. for example 28:08.92 sometimes shows up as 28:08.9. 28:08 may show up as 28:08 or 28:08:00. If it is formated as general it is 0.019548, if it is number it is 0.06, there is a time format of 28:08.9 but if I try to make a custom I get a message that says Microsoft cant use the number format I typed. eg: 60-10-b with data entry input 6010b, means last one is letter and others are numbers. I have cells that contain both text and numbers such as ABC 123. Within the same column, I also have ABC 23. When sorting, 123 comes before 23. Is there a formula to make ABC 23 ABC 023? hi. if you have several rows where some rows have the same text content while others have different, how do you NOT repeat showing the row content with same value? for example, rows 1 to 5 have ABC value and rows 6 to 10 have DEF value. how to show only ABC in row 1 and blank in remainings rows until it hits a row with a different value like DEF in which case, it should show the first occurence of DEF and blank for succeeding occurence. i have a picture to make it clearer but how to attach here? How do I display this number "SUSU/067/2018" in Arabic? I've tried using "[$-ar-SA,200]0" but it doesn't work. Great post, there is a way to create a custom format to change numbers for letters? For example in a sheet with test results, if I type 90 or more replace the number with "A" if I type a number from 80 to 89 its returns "B" instead of 80. I already have something similar with conditional formatting @" B" and the result is for example "85 B" or "90 A", There is a way to hide this "85" and "90"? I want to see as many decimal numbers as there are no zeros. I use format 0,???. Works nicely. But in case there are no decimal numbers, result is shown with decimal point (comma) at the end and it looks terrible (ex. "3," instead of just "3"). Is it possible to solve it somehow easy? _ * #,##0_ ;_ * -#,##0_ ;_ * "-"? ?_ ;_ @_ .
how do i get only 3 commas, i.e. 394,97,52,681 ? I am trying to get a number w/ comma separator for thousands but I want the decimal to be automatic. e.g. 1,200 or 1,232.32. But, I can't get the decimal to go away for whole numbers. I get "1,200." Any idea how to do this?